According to her Blogspot profile, Boski Jain is a ‘graphic designer by degree’ but she also likes ‘to illustrate too.’ Hailing from Bhopal, Boski’s career is actually more than that, and her talents go far beyond her modest declaration of craft and proficiency. All the animals you create look like wonderful baroque pieces. Instead of fur, feathers, shells or scales, you come with lines, (fabric like) patterns and dots… tell us why? Is there a way to represent not only diversity but movement too? My inspiration and ideas come from the variety of tribal arts and crafts in India, particularly the ones present in Madhya Pradesh as I have been living here and have been exposed to these more. Fabric like and block print like patterns come from them. They are bold and the perspective of the figures is simplified, hence the style can be beautifully adopted for a story for children. Is creating illustrations with somebody else’s script difficult for you? Do you feel constrained as an artist? I am not a writer (not so far). In my 2 years old career as an illustrator, I have only worked on scripts written by others and I have enjoyed doing so thoroughly. Picture books are picture driven hence I enjoy a certain degree of freedom. What did you find most challenging to illustrate in the Santal Creation Stories? Why? 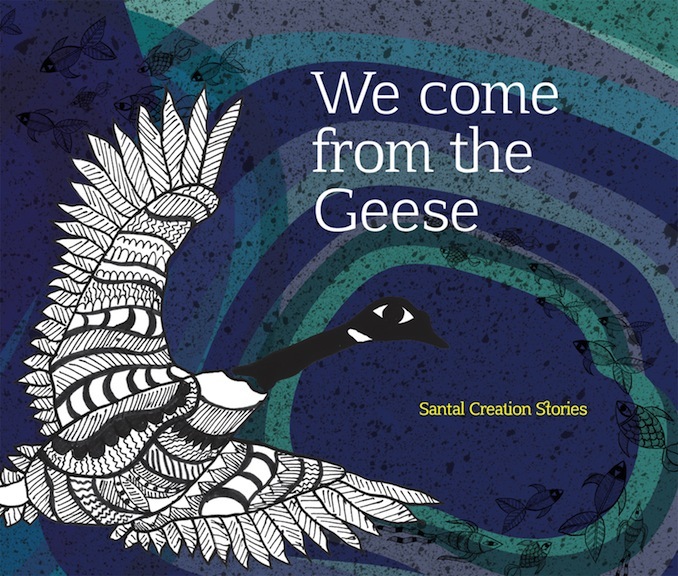 For me the worst and the best part about Santal creation stories is that I had never heard them before. It was the best because I got the chance to work on something unusual and hence I could use all of my imagination to visualize how the frames would look. The best part also includes working with editors who have placed their trust in me and have given me a lot of freedom. The most challenging part was to visualize and pictorially translate presence of certain supreme beings that are ‘shapeless, formless and inexplicable’, and yet make them comprehensible for children. These stories have been carried through from generation to generation and maybe are being published as illustrated books for the first time. Hence there was also a question constantly at the back of my head about meeting the expectations of the ones who ‘own’ these and who have been narrating them for a long time. By the way, you worked on We come from the Geese mixing digital with drawings and tint … is there a particular method to your work or is it just an intuitive way? The method for working really depends upon each frame. Usually each element is individually worked upon by hand and then they are arranged digitally to make a composition. Any new project coming soon? I’m planning to work on more books for children. Also, I’d like to work on those books which do not begin with a story but begin with a piece of art that sets the stage for the story to follow.